Somewhere in between Fast Food Nation and The Omnivore's Dilemma, between eating at McDonald’s and killing a pig for dinner, there is a need for an audiobook that will probe more deeply and provide greater understanding and insight into the psychological factors that influence decisions about what we eat and why – and how these choices affect our lives, animals’ lives, and the environment. 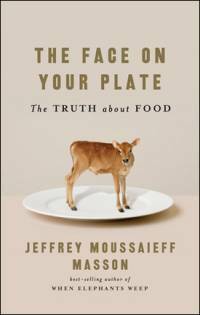 In this revelatory work, Jeffrey Moussaieff Masson, the best-selling author of When Elephants Weep, does just that, showing how food affects our moral selves, our health, and the environment. The Face on Your Plate raises questions that make us conscious of the decisions behind every bite we take: How does the health of animals affect the health of our planet and of our bodies? What effect does eating animals have on our land, on our waters, and even on global warming? What are the results of farming practices – debeaking chickens and separating calves from their mothers – on animals and humans? As a psychoanalyst, Masson uniquely investigates how denial keeps us from recognizing the animal at the end of our fork – think pig, not bacon – and each culture's distinction among animals considered food and those that are forbidden. The Face on Your Plate brings together Masson’s intellectual, psychological, and emotional expertise over the last twenty years into the pivotal book of the food revolution. Anyone who wants to be open-eyed about their food choices – vegans, vegetarians, and meat eaters – will welcome this timely work.